What Are the Health Benefits of Silver Needle Tea? What Are the Benefits of Mixing Raw Honey & Lemon Juice? The pomegranate, a fruit native to the Middle Eastern parts of the world, is actually considered a berry. Behind its thick red rind that resembles an orange or grapefruit peel is a white, fleshy pulp filled with little red seeds or berries. This popular superfruit can be ingested in its natural form, as a juice, tea or even as a supplement. According to pomepureusa.com, the pomegranate, in all its forms, delivers numerous health benefits if consumed regularly. Pomegranates are rich in antioxidants, substances that help the body fight and prevent our cells from aging. According to the ACAI Health and Nutrition Resource Center, antioxidants, such as those found in pomegranates, are shown to boost the immune system, fight and lower the risk of cancer and prevent diabetes. 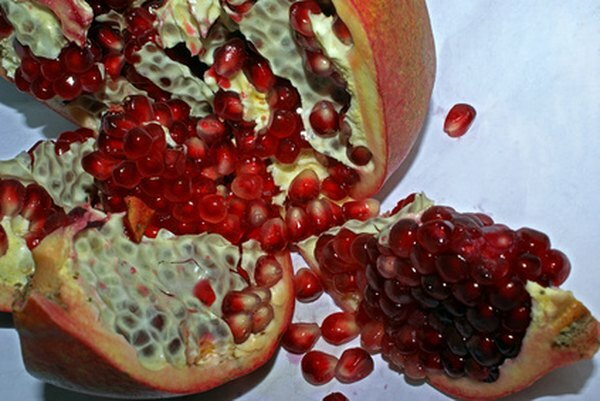 Pomegranates are good for the heart. The website Pomepure reports that drinking pomegranate juice and tea daily can "prevent blood platelets from clumping together," the same response as if you were taking a daily aspirin. The American Journal of the College of Cardiology found evidence that people with heart disease who take a daily dose of pomegranate juice or tea actually increase the amount of oxygen that gets to their heart. Pomegranates are also known to have anti-inflammatory properties. In fact, a study done by Case Western Reserve University School of Medicine proved that ingesting pomegranates actually slowed down joint conditions such as osteoarthritis. This same study also showed that pomegranates eaten daily protect the body's cartilage as well as reduce the pain often associated with joint conditions and diseases. Is Cranberry Juice Good for Women? What Are the Benefits of Mint Green Tea?